FF Multi Converter is a simple graphical application which converts audio, video, image, and document files between all popular formats, using and combining other programs. It uses ffmpeg for audio/video files, unoconv for document files, and the PythonMagick library for image file conversions. It offers common conversion options and recursive conversions through a user-friendly interface. And any other format supported by ffmpeg. 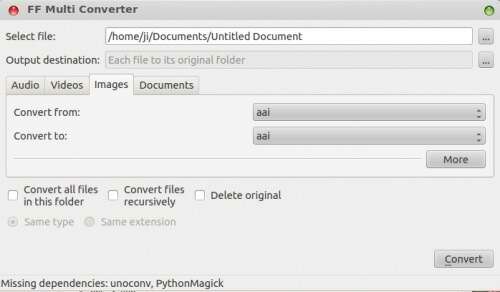 3 comments to ''Install Multi Converter (Convert Audio/Videos/Images/Documents) in Ubuntu or Linux Mint"
thanks it works .. but the converter for ubuntu i was looking for doesn't seem to be. i wanted to convert a 720p video into 480p. is there any way to do it? please let me know if any..